Peace Corps Director Ron Tschetter announced today that all Volunteers and trainees serving in the Republic of Georgia are safe, and they have been temporarily relocated to neighboring Armenia. 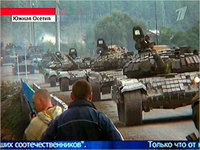 The decision to relocate the Volunteers is due to the ongoing conflict taking place in the South Ossetia region of Georgia and bordering areas. All 36 Peace Corps Volunteers and 49 Peace Corps Volunteer-trainees serving in Georgia are safe. Personnel from Peace Corps/Georgia, as well as Peace Corps/Armenia, are now supporting the Volunteers. The Peace Corps/Georgia office is still open in Tbilisi, and is constantly and carefully monitoring this situation along with Peace Corps Headquarters in Washington. Peace Corps Volunteers do not serve in South Ossetia, the separatist region located in the north of Georgia along its border with Russia. Georgia is a strong American ally whose shift toward the West and pursuit of NATO membership has angered Russia. Washington said Friday that it would send an envoy to the region to try to broker an end to the fighting. The clashes raised the specter of a wider conflict in the Caucasus region, a key conduit for the flow of oil from the Caspian Sea to world markets and an area where violent conflict has flared for years along Russia’s borders, most recently in Chechnya. Georgian forces said Friday that they had won control of the capital of the rebel enclave, South Ossetia, but Russian peacekeepers in the city said they had not seen Georgian troops in the capital, Tskhinvali. One unconfirmed report said Georgian forces had shot down two Russian planes; Georgia said its aircraft had bombed a convoy of Russian tanks that moved into the area. PCV B & C Go To Georgia writes: "We Interrupt Our Regular Progamming..."
As you may have seen on BBC or CNN, Georgia and South Ossetia have come to blows again (South Ossetia is the breakaway region just north of Gori). Gori, as you may remember, is where we lived last summer during training. This year, luckily, the trainees are in a different location. Gori is, still, however, on the main road between our site and Tbilisi. There's been fighting and troop movement for the past few days, as happens every few months and we were on Alert, but everything seemed well enough this morning. The highway is out and we're on standfast (meaning we're to stay put), so, conversely, I'm stuck in Tbilisi, while Brenden can't get here. Meanwhile, one of the bombs hit the major cell phone company's office in Gori, so cell phone service is unreliable. However, since I'm at the Peace Corps office in Tbilisi, I should be safe and have Internet access, and although Brenden isn't, he's with the Peace Corps staff. Neither of us are near the border with South Ossetia, so although things will probably get worse before they get better, I'm not worried about our safety.